Thousands of anti-abortion activists rallied in the US capital Friday for their annual March for Life, fired up by President Donald Trump, who cheered on their "beautiful cause" in a live address from the White House. Addressing marchers on the National Mall by videolink -- the first sitting president to do so -- Trump delivered an emphatic message of support for the 45th edition of the rally, which bills itself as "the world's largest pro-life event." 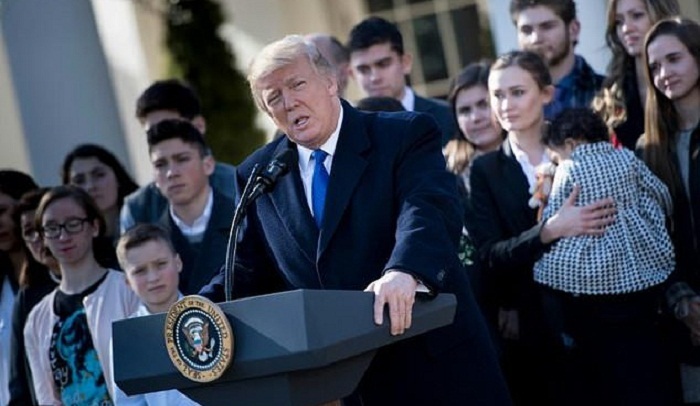 "The March for Life is a movement born out of love," the president said from the White House Rose Garden, declaring himself "honored" to address the colorful crowd of families, students and religious groups who brandished banners reading "Choose Life." "You love your families, you love your neighbors, you love our nation and you love every child -- born and unborn -- because you believe every life is sacred," Trump said. Friday's march marks an anniversary which infuriates anti-abortion activists -- the Supreme Court's historic ruling on "Roe v. Wade," which legalized the procedure across the United States in 1973. Criticizing "Roe v. Wade," Trump reiterated his support for toughening what he called "some of the most permissive abortion laws anywhere in the world" -- and in particular for Republican efforts to ban almost all abortions after 20 weeks, which are only allowed in a handful of US states. Trump has previously asserted -- including during a presidential debate against Hillary Clinton -- that US law permits doctors to "rip the baby out of the womb" in the ninth month of pregnancy, a fallacy circulated in hardline anti-abortion circles. The president appeared to misspeak in making the same point during his Rose Garden address -- stating, confusingly, that "in a number of states, the laws allow a baby to be born from his or her mother's womb in the ninth month." But the hiccup did little to dent the enthusiasm on the National Mall, however, where the crowd was buoyed by Trump's high-profile show of support. "I really appreciated him taking the time out of his day to speak to us," said Sandy Burton, who travelled all the way from Indiana to make her views known. "We have a dream that abortion would be an unthinkable solution. In the land of America, we value life, we honor life and we hold life sacred in all of its forms." Al Adams, from New Jersey, had a similar takeaway from Trump's speech. "He is not afraid to take a stand. He is not afraid to speak his opinion," Adams said. "His message was we are all here for pro-life, we are here to stop abortion, we are here to end killings of babies." As someone who has voiced support for abortion rights in the past, Trump at first seemed an unlikely champion of the so-called "pro-life" movement. But Vice President Mike Pence, addressing the movement's leaders at a White House reception Thursday evening, described Trump as "the most pro-life president in American history." "I truly believe the day will come, because of your efforts and prayers, with pro-life majorities in our Congress, with President Donald Trump in the White House, I know America will choose life, once again," added Pence, who spoke at last year's rally, right after Trump's inauguration. Himself a staunch opponent of abortion, Pence highlighted the administration's efforts to curb access to the procedure, including by rolling back Obama-era rules protecting funding to clinics that offer abortion services, such as Planned Parenthood. This year's march also follows the creation of a new Department of Health and Human Services office to protect religious rights of medical providers who refuse to perform procedures they say are against their beliefs -- a move slammed by health care and rights groups alike. Louise Melling, deputy legal director of the American Civil Liberties Union, accused the Trump administration of "doubling down on licensing discrimination against women and LGBT people, all in the name of religion."